Attention to all stargazers, a rare celestial event, is going to happen on 9th of May 2016. An event which is going to be occurring only thirteen times a century. Earth’s small neighbouring planet Mercury will be seen travelling directly in between Earth and Sun. This travel is termed as Mercury Transit by the Space Scientists. According to the scientists, the transit is best pointed in eastern North America, South America, Western Europe, Africa and some parts of Asia. It would be started at the time of sunrise in America and ends during the sunset in most parts of Europe, Asia and Africa. The journey would take 7.5 hours to cross 864,300 miles for mercury to pass through the face of the sun. The smaller planet would be seen making a dip at the brightness of sunlight on which many scientists are eyeing on. As the planet Mercury is very tiny and it is slightly bigger than the moon, it is very hard to see its movement with naked eyes. It is also not advisable to see the sun directly without any filter even with sunglasses; it would harm human eyes. Using Special wearable or telescopes would give a clear vision of the transit. Whenever a transit occurs, each time some unknown facts have been revealed. 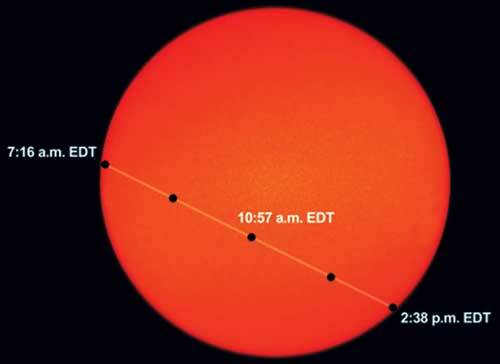 It first started in 1677 when the first transit of Mercury happened a space scientist named Edmond Halley, discovered that if the transit viewed in various noted angles at different latitudes. The different angles can be used to calculate the distance between sun and earth. In the 20th century, NASA explained that the transits can be used to study the thin layer of gases which is around Mercury, known as an “exosphere. He stated that the Sodium present in the exosphere absorbs and re-emits a yellow-orange color from sunlight. By calculating the stats of that absorption, we can learn about the density of gas. During the present transit, the scientists at the Big Bear Solar Observatory in California are planning to catch a peek of sodium in the planet’s exosphere for knowing how it escapes the planet’s surface. Mercury continues to be the source of several mysteries and facts. The event is going to be live streamed by National Aeronautics and Space Administration via its internet channel NASA TV with expert’s commentary. NASA is also organizing other discussions,Q & A sessions with their scientists answering to the doubts and questions asked by viewers via Twitter using tag #AskNASA.